From the first moment I heard this lyric, by singer/guitarist/songwriter Marc Bonilla, I was entranced by the imagery it presents. 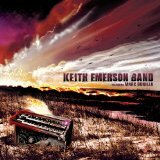 The lyric is found on the CD “Keith Emerson Band featuring Marc Bonilla”. Some of you classic rock fans might recognize Keith Emerson as the keyboard genius with the 1970s progressive rock giants Emerson, Lake & Palmer. Grudges we can’t (or won’t) release. Bad habits we’ve lived with for so long that we don’t even recognize how destructive they are. Attitudes that quietly, subtly poison us and our relationships. 2. We’re trying to run away from this burning man (or woman). Somehow, during moments of clarity, we recognize at least some of the damage we’re doing to ourselves and those around us. We actually get it, that this burning man is making us miserable and, at some point, all this burning will hollow us out. 3. This burning man (or woman) is inside us. So I can run forever and not get away. I can travel in the fastest race car and it won’t make any difference. I can even leave the planet on the space shuttle, but that burning man will still be with me. He’s a police sniffer dog I can’t shake, a shadow that never leaves me. This is good news, at least in my books. But how can this make a difference in our lives? I suggest the answer lies in seriously checking out the claims of Christianity. I found that when I decided to believe in and follow Jesus Christ (whom serious Christians believe is God’s son), He came to live inside me. And the longer He lives inside me, the more space he takes up and the less space there is left for the ‘burning man’. Eventually, if I’m serious about my faith, Jesus will have the run of the house and the burning man will be left in the basement, shivering, cold and powerless. I love the image of Jesus having “the run of the house.” 🙂 Yes, the longer we follow Him, the greater His influence becomes. It’s a maddening world to try and reign in the flesh. That’s why we are instructed to “walk in the spirit”, or hand over the reigns to Jesus and allow the Holy Spirit to manage our lives.